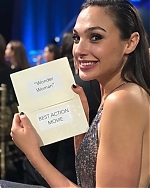 gal_gadot: "Obrigada, @nbrfilm, pela noite incrível e pela homenagem a Patty e eu com o Spotlight Award. #MulherMaravilha"
Original: "Thank you @nbrfilm for the wonderful night and for honoring Patty and I with the Spotlight Award. #WonderWoman"